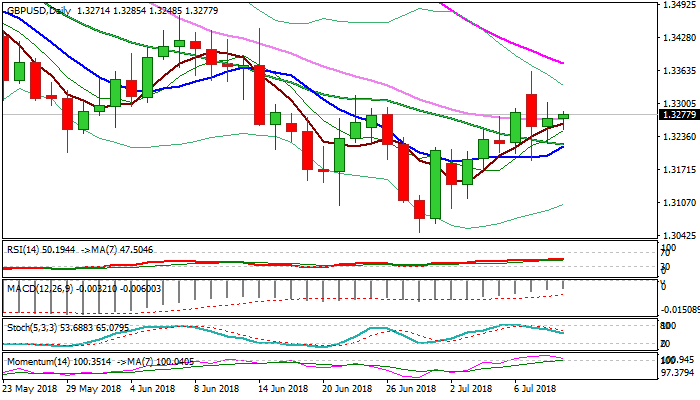 Cable holds within tight range in early Wednesday’s trading, with slight bullish bias following Tuesday’s positive close and recent M&A news. Immediate downside risk following political turmoil in the UK is sidelined for now, but risk aversion on renewed trade war concerns and bearishly aligned techs (thick daily cloud continues to weigh along with south-heading momentum and slow stochastic) may limit upside attempts. Bullish signal could be expected on violation of upper pivots at 1.3380 (daily cloud base/falling 55SMA) while converged 10/20SMA’s mark lower trigger at 1.3215, loss of which would be a bearish signal.